HomeTestimonialsI No Longer Crave Sugary Carbs! After a recent bout of stress I noticed my weight increasing, especially around my abdomen. 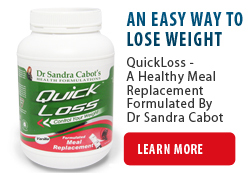 I have been a long-term client of Dr Sandra Cabot so I knew exactly what I had to do; replace one meal a day with QuickLoss. This also reduced some of the stress worrying about breakfast whilst racing out the door every morning. I also enjoy a Synd-X smoothie made with fresh berries and consumed in between meals. Add to this healthy mix, nutritious meals from your healthy liver eating plan and my weight has corrected itself. I am also happy to say that the stress has been easier to deal with. I actually have had more time to do the fun things in life because my meals have been simplified and I automatically go for the good stuff in the fridge! I was beginning to worry about Christmas and not being able to control my food intake. I feel much more in control now and enjoy eating without feeling guilty that I really don’t crave the sugary carbs! So I just wanted to say thank you and I wish you happiness and good health. This Is The Longest I Have Ever Kept Weight Off!